If you don’t have a broody breed of hen or it seems unlikely that your hen will go broody then you can artificially incubate your eggs. It is slightly more complicated and time consuming to incubate an egg yourself using an incubators for example you will have to check the egg regularly . However, if you have a large number of eggs but incubators tend behave more reliably than a hen and practice makes perfect. Incubator - for example the Brinsea Mini Eco is a great starter incubator. Candling lamp - such as the Brinsea Ovaview to help you watch your eggs develop. Anti-bacterial cleaning solutions- Virkon S tablet. There are a reasonable number in incubators available on the market. 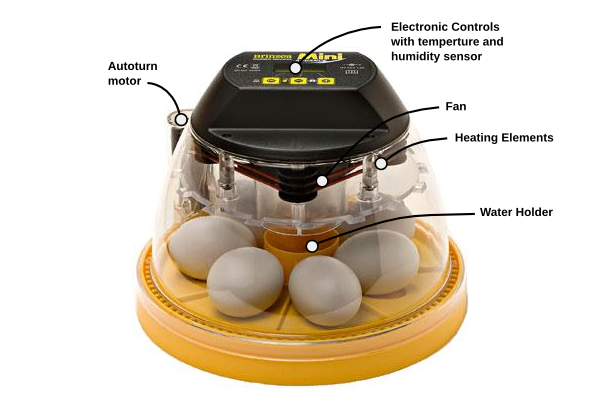 Most incubators work in a similar way by providing heat and humidity to the developing egg. Below is a diagram showing the basic components that make up an incubator. The basic parts of an incubator. This is probably the most important question and will to a great extent dictate your choice of incubator. When making the calculation of how large an incubator you would like, you need to account for infertile eggs and the inevitable cockerels. Only between 50-80 percent of the eggs you start with will hatch and half will be cockerels. So, if you want 5-10 hens you should aim to incubate 20 eggs. Your eggs will need to be turned over 3-5 times a day. It is easier and more reliable to get an incubator with an automatic egg turner however these incubators are generally more expensive. You can buy incubators with or without fans. Incubators without fans rely on the natural circulation of air (hot air rising and cold air falling) to give an even temperature throughout the incubator. f Incubators with fans are now very popular and Omlet only recommend using incubators with fans because they have an increased success rate. Did you see the Fake Britian programme last week about fake incubators which are being sold, do your customers need informing? Mine is a Pekin bantam a she is safe!!! !